The history of Spanish politics in the 20th century swung from constitutional monarchy to dictatorship to republic and back to dictatorship again. The dawn of the Spanish Second Republic in 1930 was an interesting time and the struggles for ascendancy between the right and left resulted in the outbreak of the Spanish Civil War and 35 years of rule by General Franco. Miguel Primo de Rivera was a dictator, aristocrat, and military officer who with the support of King Alfonso XIII and the army led a military coup in September 1923 and became Prime Minister of Spain until 1930. He deeply believed that it was the politicians who had ruined Spain and that governing without them he could restore the nation. He promised to eliminate corruption and to regenerate Spain. In order to do this he suspended the constitution and established martial law. Primo de Rivera initially said he would rule for only 90 days, however, he chose to remain in power. Little social reform took place but he attempted to reduce unemployment by spending money on public works to build infrastructure for an economically backward country. While Spain benefited from the European post-World War I boom, its economic growth also came from Primo de Rivera’s policies and the order his regime gave the country. Unemployment largely disappeared. But Primo de Rivera brought order to Spain with a price: his regime was a dictatorship, albeit a mild one. He censored the press. To suppress the separatist fever in Barcelona, the regime tried to expunge Catalan culture. Furthermore, many of the dictator’s economic reforms did not actually help the poor as huge public spending led to inflation, which the rich could cope with more easily. This led to a huge income disparity between the wealthy and working classes in Spain at the time. As Spaniards tired of the dictatorship, the economic boom ended. The value of the peseta fell against foreign currencies, 1929 brought a bad harvest, and Spain’s imports far outstripped the worth of its exports. Conservative critics blamed rising inflation on the government’s spending for public works projects. When Primo de Rivera lost the support of the king and the armed forces, his dictatorship was doomed. The Spanish military had never unanimously backed his seizure of power, although it had tolerated his rule. Rivera’s recognition that the king no longer backed him, persuaded him to resign in 1930. Primo de Rivera had a good chart for a paternalistic dictator. His Sun was in Capricorn closely conjunct the Midheaven. When the Sun is so close to the Midheaven its always likely that the individual will rise to the top of his chosen career. The rule of a Capricorn Sun is likely to be paternalistic, organised and pragmatic. Its not the same as a Leo dictatorship which might view its position as being by divine right or an Aquarian one that comes into being initially for idealistic reasons, or an Aries or Scorpio rule that is maintained by brute force. 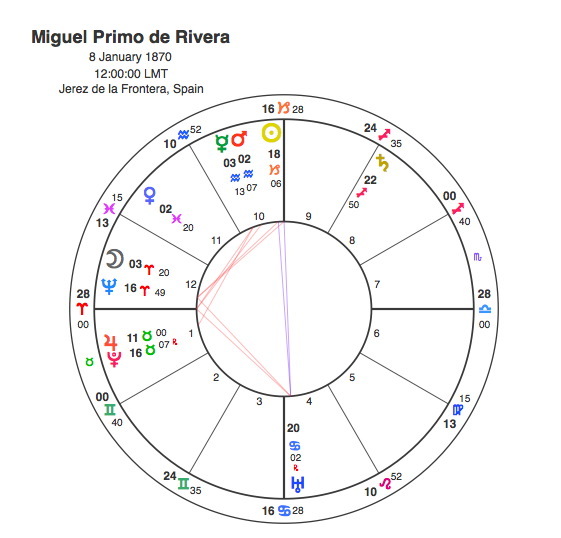 De Rivera had both the Moon and Ascendant in Aries with Jupiter conjunct Pluto in the first house which is quite appropriate for someone who came to power via a military coup. The Sun is part of a T Square with an opposition to Uranus in the 4th house which would indicate a sudden change ( Uranus ) in de Rivera’s support ( 4th house / base of chart ). This opposition focused onto Neptune at the apex of the T Square which undermined his rule ( Sun in the 10th ). When would this happen ? Pluto reached the T Square in 1930 conjunct Uranus, opposite the Sun and square Neptune. Manuel Azaña Díaz was a strong critic of the dictatorship of Primo de Rivera, he was a signatory of the “Pact of San Sebastián”, which united all the republican and regionalist parties in Spain against Primo de Rivera and the King. In 1931, republican candidates swept the municipal elections and Azana became Prime Minister, leading a coalition of left-wing parties. 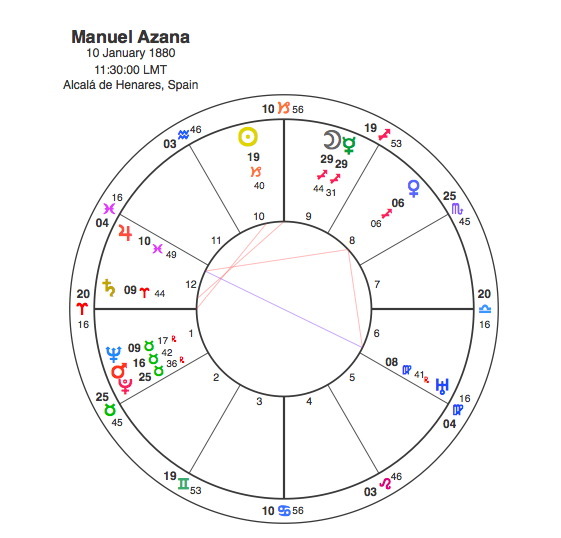 The incredible thing about Azana’s chart was its similarity to Primo de Rivera’s. Both leaders had a 10th house Capricorn Sun with Aries rising. Their Sun’s were also in very close conjunction to each other. This meant that Pluto’s transit would effect both at the same time and the dark planet was opposite Azana’s Sun when he became Prime Minister. Azaña pursued some of the major reforms anticipated by the republican program but he was a “middle-class republican”, not a socialist and the Azaña government did very little to carry out the reforms either of land distribution or of the taxation system to shift the burden of government onto the wealthy. Also, the government continued to support the owners of industry against wildcat strikes or attempted takeovers by militant workers. Azaña was a man of very strong convictions and has been called “the last great figure of traditional Castilian arrogance in the history of Spain.” As a “middle class republican”, he was implacably hostile to the monarchy and the Church and his extreme anti-clerical program alienated many moderates. Thus Azaña came into conflict with both the right and far left and he resigned in 1933. He was replaced by a right wing party which ruled until 1936 when Azana returned as the head of a coalition of a Popular Front of left wing parties. In many areas the “Reds” or anarchists became the effective rulers, while Azaña was paralysed. Many historians suggest Azana’s weakness in dealing with the Socialists was the main cause of the Spanish Civil War. With the defeat of the Republic in 1939, Azana fled to France, resigned his office, and died in exile shortly afterwards. Although Primo de Rivera and Manuel Azana were implacable foes and appeared to come from opposite ends of the political spectrum, they were both relatively weak leaders and the actual results of their time in charge were much the same. Both leaders in their own way, unintentionally laid the ground for the Spanish Civil War and 35 years of General Franco’s rule. Whatever protests may be made to the contrary, Manuel Azana’s chart revealed the truth. Pluto asked Spain to meet the new boss, unfortunately he was much the same as the old one.